The Walking Dead has been on the air for almost a full decade, but like the zombies on the show, the series is refusing to die. Halfway through season 9, news of AMC renewing the show for season 10 has just been made official with a new teaser video posted to showrunner Angela Kang's Instagram account. The clip gives viewers a peek at the Whisperers, while promising season 10 will arrive in October. This will extend the series into 2020 at the very least, ensuring The Walking Dead's run will have lasted at least ten years. Whether it can make it into season 11 and beyond remains to be seen, but for now, the show definitely isn't going anywhere. If the source material from the graphic novel series is any indication, the story is moving closer to the Whisperer War. This scary group of villains wears the flesh of the dead over their own, communicating only with silent whispers. The group's leaders, Alpha and Beta, will be portrayed by Samantha Morton and Ryan Hurst in the upcoming episodes. Probably the most horrifying yet of all the antagonists encountered on the series, chances are the Whisperers won't be through with our group of heroes by the end of season 9, further pushing the conflict into the guaranteed tenth season. The Walking Dead Season 9 marks a major change in the long-running series, almost giving the current season the vibe of a sequel. Many major players have been written out, and a six-year time jump has further distance the show's current story from what fans had been watching for the first eight seasons. The new season also marks the first with new showrunner Angela Kang, whose work has been earning praise from critics and fans alike. 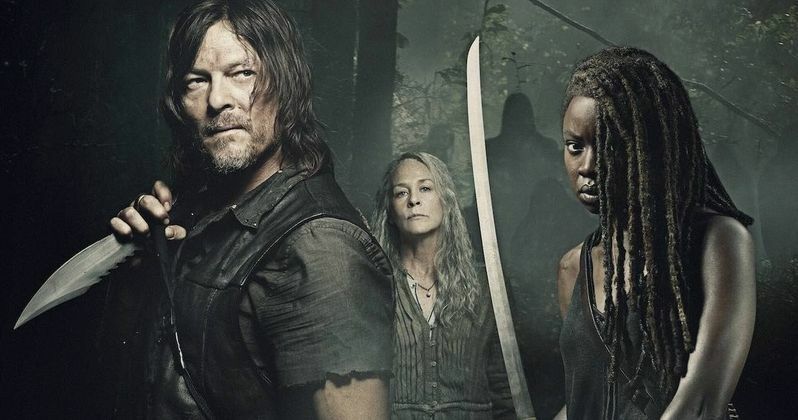 Critically, the consensus is that The Walking Dead is creatively on the upswing, with episodes more interesting than those seen in recent seasons. Still, with ratings far lower than what they used to be, the possibility remains that the upcoming tenth season could be the show's last. Rick Grimes was written out of the show earlier in season 9, but that's not going to be the end of the road for the character. Andrew Lincoln will reprise the role in three upcoming made-for-TV movies for AMC to properly close out his story. Of course, Rick's story began with his search for his missing wife and son, with the policeman managing to track them down against all odds. Both would end up dying in the years ahead, putting a rather depressing end to the Grimes family saga. How the movies will handle the character remains to be seen, and as Rick's exit is not something to happen in the comics, there's no telling what will ultimately happen with him. In addition to the confirmation of season 10, AMC has also released a sneak peek teaser for the next episode of The Walking Dead. It touches on the difficulty the survivors face in determining who are the walkers and who are the Whisperers when faced with an oncoming group of zombies. You can take a look at Kang's Instagram post and the midseason premiere teaser below, and watch the episode when it airs on AMC on Feb. 10.